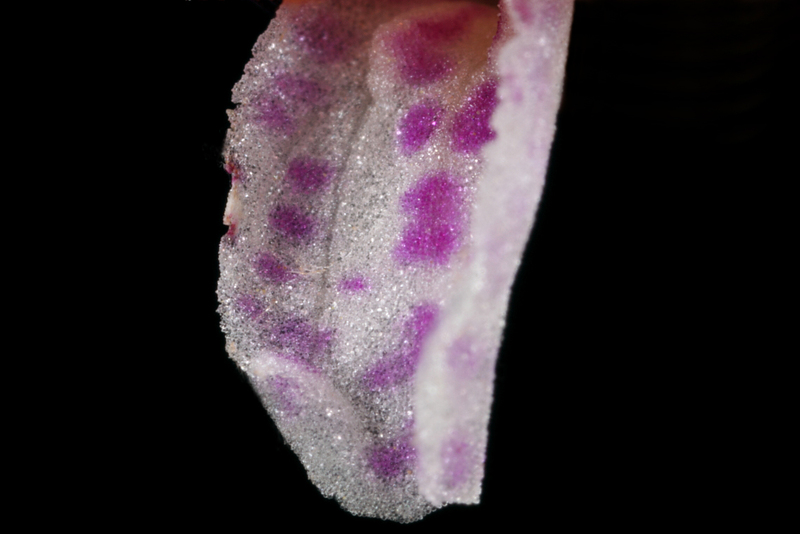 ¹ Interestingly, the lip is actually derived from the uppermost petal, but in most species the flower twists during development so that the lip is oriented at the bottom. Missouri is home to 34 species of orchids (one introduced, and another discovered in Missouri for the first time just a couple years ago). None of them are truly common like Rudbeckia or Coreopsis, although some are far more common than is realized. I’ve featured a few of these previously, including Spiranthes magnicamporum (Great Plains Ladies’-tresses), Platanthera lacera (green fringed orchid), Aplectrum hymenale (Adam and Eve orchid), and Goodyera pubescens (rattlesnake plantain orchid). I’ve traveled to the far corners of the state to see them, but for today’s featured species—Corallorhiza wisteriana (spring coralroot)—I had to travel no further than my front yard. I’m sure my neighbors hate my front yard. I don’t use fertilizers or herbicides, and I’m unconcerned about the moss that grows amongst the thin stands of mixed grasses under the tall native oaks that shade much of the yard. My neighbor down the street especially probably shakes his head as he walks his dog past my yard every day, frustrated that I don’t share his passion for the lush, thick, über-green bluegrass monoculture that he has achieved (and must pay somebody to cut at least once a week). Spring must be especially frustrating for him, as I don’t even cut the grass until late May, giving the lawn an especially ragged, unkempt appearance. However, whatever my yard lacks in graminaceous greatness, it more than makes up for in its diversity of woodland natives—spring beauty, toothwort, trout lily, violets, coral bells… and spring coralroot. I have several colonies growing at different spots in the yard, all marked with surveyor’s flags to prevent accidental trampling until their bloom period ends and I can (begrudgingly) begin mowing the grass (no more than once a month, if I can get away with it). I’ve enjoyed these coralroot colonies every spring since I’ve lived here, but this spring was the first that I took the opportunity to photograph their blooms. Of the three Corallorhiza species that can be found in Missouri, C. wisteriana is the most common, occurring in rich or rocky acidic soils of low wooded valleys, ravine bottoms, along streams and on ridges and slopes of open woods (Summers 1981). My yard qualifies as the latter, occurring on a limestone ridge in mesic upland forest made only slightly more open by the late 1980s construction of the neighborhood and its minimal disturbance limited to the roads, driveways, home footprints and a small amount of associated lawn. 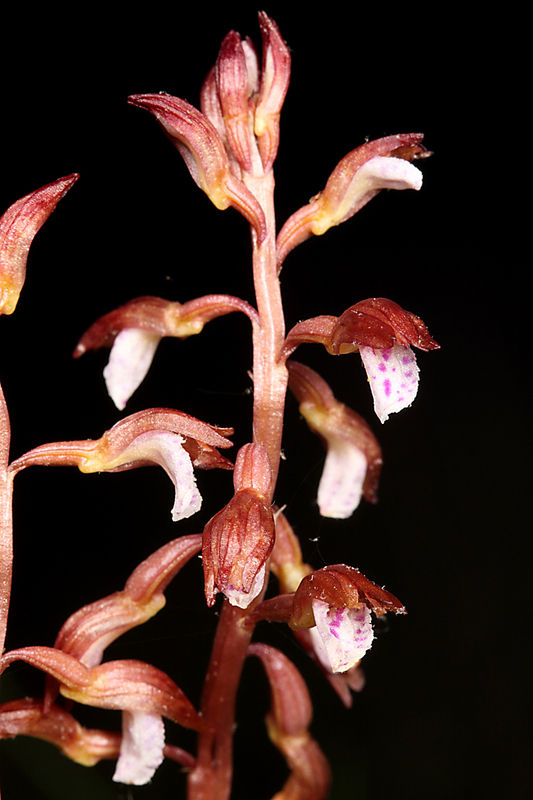 It is distinguished in Missouri from C. odontorhiza (Autumn coralroot) by its spring flowering period and larger flowers with notched or lobed lip, and from the rare C. trifida (known from only a few Missouri counties) by the purple or brownish stems and spotted lip. As suggested by the unusual coloration, Corallorhiza species are largely (though not completely) lacking in chlorophyll, and as a result are mostly unable to photosynthesize their own food. Instead, the bulbous rhizomes remain hidden within the soil for much of the year, forming symbiotic relationships with soil fungi and flowering only when conditions are favorable (Luer 1975). The past several springs have been wet here, and accordingly I’ve been rewarded with the wonderful sight of these exquisite tiny blossoms. I can’t say that I’m entirely happy with these photographs, as I found it difficult to get the entire blossom in focus—when the petals were in focus the lip was not, and vice versa, even in straight lateral profile. Nevertheless, they still show the delicate structure of the lip, with its scalloped edge and crystalline-appearing surface. The blooms are fading now—soon there will be no above-ground evidence of their existence, and my neighbor and wife will likely gang up on me to finally power up the lawn mower. Luer, C. A. 1975.The Native Orchids of the United States and Canada Excluding Florida. The New York Botanical Garden, 361 pp. + 96 color plates. Summers, B. 1981. Missouri Orchids. Missouri Department of Conservation, Natural History Series No. 1, 92 pp. This entry was posted in Orchidaceae and tagged Botany, Friday flower, Missouri, nature, orchids, science, wildflowers. Bookmark the permalink. Nice Ted. We don’t have that species of Corallorhiza in Cali, but we do have C. trifida, and it is rare here as well. Our C. maculata bears a close resemblance to your wisteriana, and is likely a close relative. 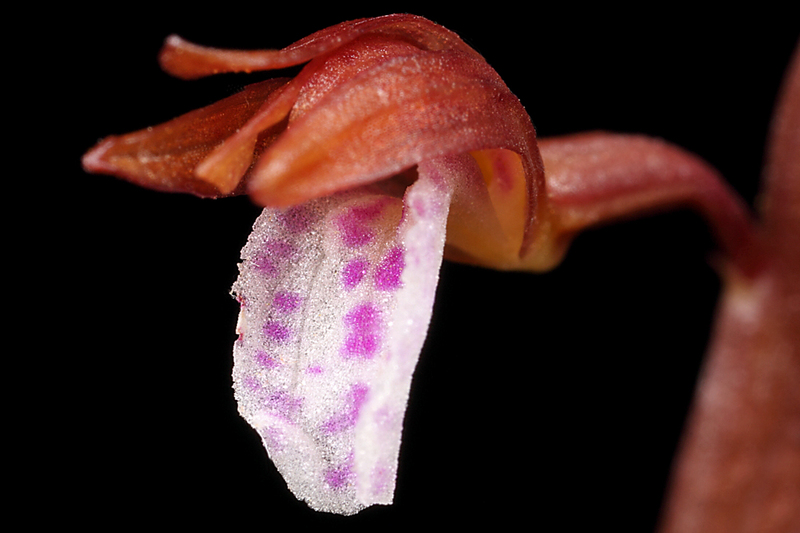 Also interesting: we have pretty much the same number of orchid species as y’all: 35. And, I’m going on a CA Native Plant Society field trip on Sunday that should allow me to see several more of them for the first time. So, thanks for the inspiration! Hi Ken – I’m kinda surprised our little ol’ state has as much diversity as your great biodiverse state. Nice photo of C. maculata – it sure spreads its petals much more nicely than C. wisteriana. I’ve only been to your house once, at night, in winter, for an entomology gathering. But from your description, I already love your yard. Let the neighbors grimace. I say without hesitation that it is they who are wrong. I keep gradually reducing the “grass” area and expanding the mulch/shrub beds. One day I will be grass free! A beautiful, delicate flower. I take it we won’t be reading about you winning Yard of the Month honors anytime soon. 🙂 Out here in the boonies, I keep a fairly large area mowed just so we don’t have to walk through knee to waste high weeds and grasses. However, I also leave numerous clumps of “weeds” with only paths mowed through them, both so we can enjoy the wildflowers and so I can photograph pollinators. If I ever win Yard of the Month, I’ll know it was a month wasted! I’ve always liked the path approach to managing large herbaceous areas – I find it more pleasing aesthetically than a uniform, mowed lawn. It’s really wonderful that these plants find the right conditions in your front yard. They’re really thriving! Living proof that we can enjoy native plants around home. Obviously, you’re having more fun in your yard than your chem-lawn neighbors. I’ve always considered the lawn to be, for most people, an extension of their carpet – a way to sterilize and tame the outdoors so they can be comfortable. Those people surely know not what they’re missing. Who knew! When the little red flags started appearing in our yard, I thought AT&T was planning something big, but then Ted explained their reason for existence and why the yard wouldn’t be cut until the end of May. I just shake my head and accept that this is simply another “little” quirk that makes my husband so endearing. We do live in the middle of the woods … and I for one can’t wait until there is no more grass. Exquisite! Beautiful photographs; you are too modest. In Ontario, we have a cosmetic pesticide ban and the movement to say no to grass is slowly growing. In the summer of 2009, the City of Ottawa issued a notice of violation for maintaining a garden with native plants. The notice instructed the homeowners to cut down their garden or risk having the city do the work and send them the bill. After Ecojustice threatened a court injunction, the City backed down and is now modifying bylaws to allow for natural gardens. Hi BFH – thanks for your kind comment, and I’m glad to hear the city of Ottawa is finally (if begrudgingly) doing the right thing. 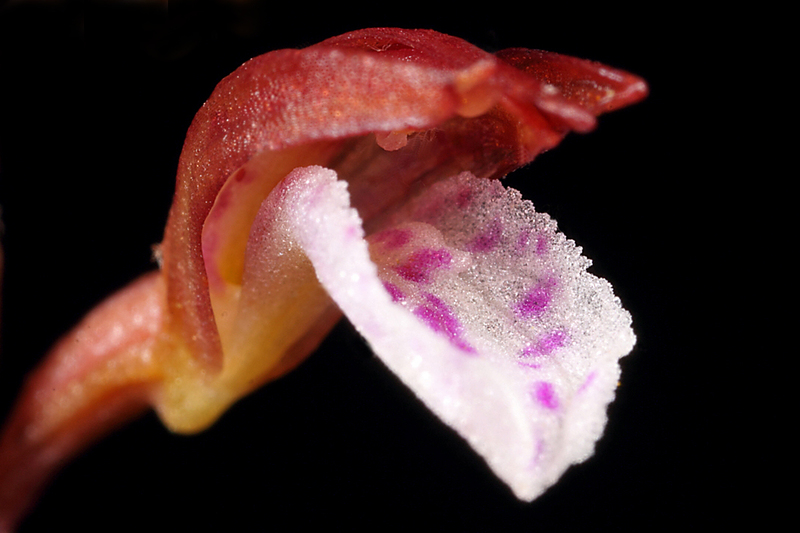 Thanks for sharing this little orchid with us. I’m always fascinated by how ‘ugly’ many orchids are ‘from a distance’ and, yet, how beautiful the flowers are when you get up close. Perhaps there’s a survival advantage in that. I’m also chuckling at your lawn maintenance. We live in the country. We’ve stopped mowing the field in front of our house to allow the native wildflowers to flourish throughout the year and only mow in winter before the next year’s plant start to emerge. Over the years, we’ve found many unusual wild flowers – orchids and others – that reward us for this practice. And, since we live in the country, there are fewer neighbors to tsk, tsk as they drive by. Hi Joan – I agree, I never realized how extraordinarily intricate these flowers were until I looked at them through the macro lens. 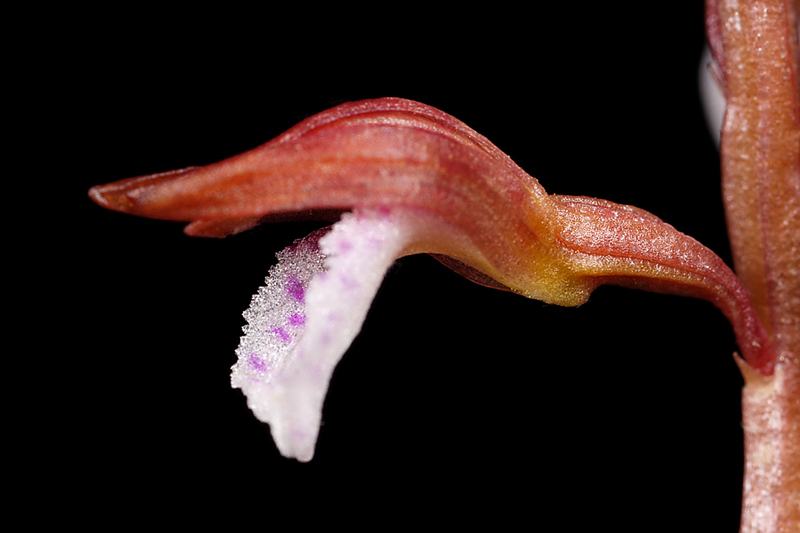 I think it’s just a matter of scale – these orchids are obviously after very small pollinators. Every year since I’ve owned the house a few more colonies have sprung up. I couldn’t be less interested now in a lush green carpet of grass, when I can look at beauties like these instead.